Fashion is all about innovation and evolving to set new trends to follow, this extends to fashionable nail polishes as well. Nail polishes have always been known for offering a wide variety of colors to bring fashion and life back to plain nails. 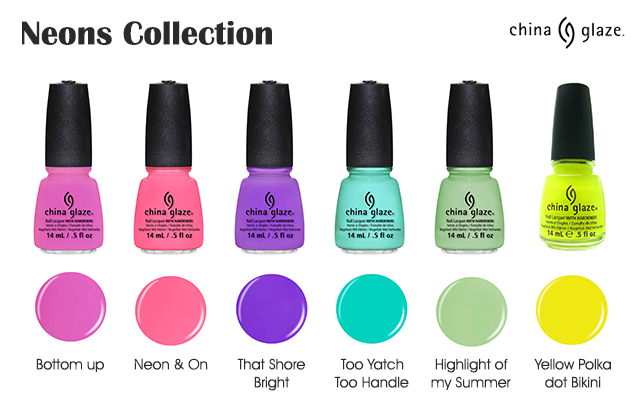 Debuting August 2013, China Glaze Malaysia has finally brings two more collections by following the latest trend of Malaysian female fashionista which were Neons Collection and Texture Collection. The trend now is about all things neon which brings the youthful, trendy, hip and chic look. From cosmetics, to gadgets and apparels, people are starting to embrace neon colors on whatever they own and wear on themselves. So, why not nail polish as well? Why not wear neon nail polish colors to complete the whole neon look? Summer Neons Color Collection ranges brighten up nails regardless of whichever skin tone and ensures you look hip and trendy to whatever occasion you are going to. These neon color shades are so trendy, that you don’t even need bling blings on your hands to attract people in the eye!! ‘Texture’ by China Glaze is the next ‘in’ thing in the nail polish industry. Texture provides a sand-like feel to nails. With 4 colors, this range provides the best assemble to your summer fashion as it gives you the feeling of the beautiful sandy beaches in the summer and also can play with the variety of pastel colors available in texture from China Glaze. Textured nail polish offers a different feel and style to nails. Plus, with the sweet pastel colors available in this textured range, it provides fashionista who wants to showcase their edgy yet girly side. China Glaze Neons and Texture Collection are really bright, pop and attractive. The colors are vibrant enough and easy to apply with (except Yellow Polka Dot Bikini aka Neon Yellow "needs to apply few more coats"). What colors in my hand? What yours favorite colors in China Glaze Neons and Texture Collection? Texture range or Neon Range? 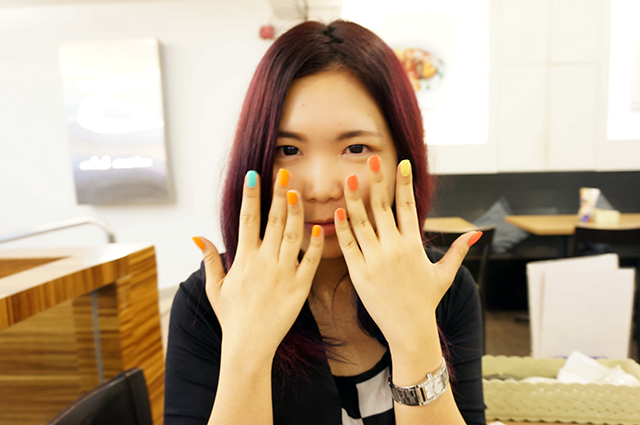 Visit China Glaze Malaysia for more pretty cray nails updates. the orange nails looks like orange skin! hehe, but still so pretty!